To avoid injury or falling while ascending or descending stairs after an injury or surgery, it is important to learn the safest techniques for negotiating steps. Which leg goes first, the injured leg or the strong one? Where should helpers be and should you use a handrail? 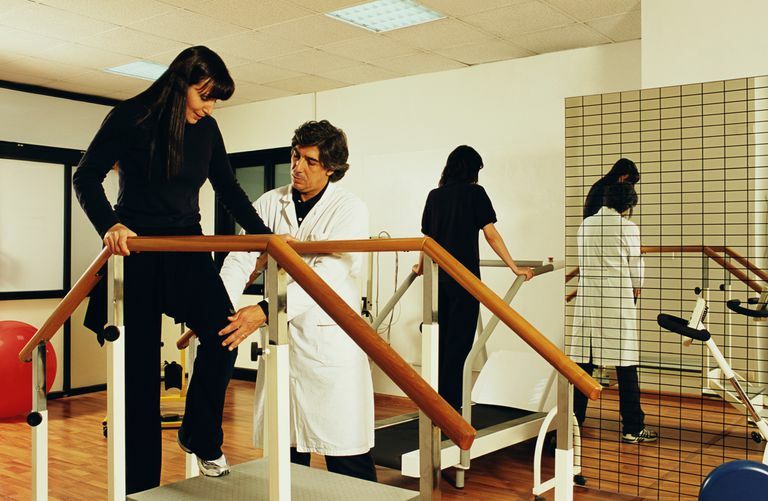 What is the best way to walk up and down stairs after lower extremity surgery or injury? Your physical therapist can show you. Which Foot Goes First When Walking Up or Down Stairs? The phrases “up with the good, down with the bad”, or “the good go up to heaven, the bad go down to hell” are often used to help patients recall the appropriate step pattern for stair climbing after injury or surgery. If there is no rail for assistance, one must also learn how to appropriately use their assistive device on the stairs. To properly ascend stairs, it is “up with the good.” While holding onto the rail with one hand, advance the stronger leg first placing it on the step above where you are standing. After this unaffected leg is appropriately placed on the step, advance the weaker leg up to the same step that the stronger leg is on. If there is no rail to hold on to, a cane is placed on the upper step at the same time or after placement of the weaker leg. To properly descend stairs, it is “down with the bad.” While holding onto the rail with one hand, advance the weaker leg first placing it on the step below where you are standing. After this affected leg is appropriately placed on the step, advance the stronger leg down to the same step that the weaker leg is on. If there is no rail to hold on to, the cane is placed on the lower step at the same time or after placement of the weaker leg. That way, your cane is there for support while your stronger leg is being lowered down. How Do I Help Someone on the Stairs? If you are helping someone walk up or down the stairs, positioning your body in the correct position is important. That way, you can provide maximum support with minimal interference. When someone is walking up the stairs, stay behind them by one or two steps. Resting one hand on the back of someone's pelvis is enough support. That way, if the person falls backward, he or she won't be injured by falling down the stairs. When someone is walking down the stairs, again, stand one or two steps below them. Give enough room for the person to step, but be ready to offer support. Standing below your friend on the stairs helps prevent falling down the stairs if a tumble occurs. Are There Exercises to Help Improve Stair Climbing? If you are having difficulty walking up or down stairs, your PT can spend some time with you to teach you how to do it. He can also prescribe exercises that can help strengthen the muscles that help you climb stairs more easily. These exercises can be done in the PT clinic or as part of a home exercise program. Just be sure to check with your doctor before starting any exercise to make sure that it is safe for you to do. All of these exercises have one thing in common: They all focus on the "anti-gravity" muscles. These are the muscles of our legs that help keep us walking and upright against the force of gravity. The exercises to help improve stair climbing can be done 3 to 4 times per week. Remember, do not scarification functional mobility to get the exercises done. If you work your leg muscles too hard, you may not have the strength and stability to walk safely throughout the day. Balance your exercise program and your functional activity. Your physical therapist can show you how. Remembering stair climbing techniques will help keep you safe while going up or down stairs. This strategy will make stair negotiation easier, therefore preventing further injury or damage to already weak lower extremities or injured tissues.